The ST Fitness 8820 Total Body Trainer is nearly identical to the 8810 model, but this one comes with a self-contained power supply so you don’t need access to an outlet to plug in the console. The ST Fitness 8820 Total Body Trainer comes with a multi-color LCD readout displaying stats for Time, Heart Rate, Distance, RPM, Calories, Watts, and more. In the 11 workout programs you get 6 profiles including hills and intervals, 3 heart rate programs (Fat Burn, Target HR, Interval HR), and 2 custom profiles. UPDATE: As of 2016, it looks like Star Trac is no longer distributing the ST Fitness brand ellipticals. For comparable models, take a look at our top picks in the $500-$1000 range as well as the $2000-$3000 range to find a model similarly priced to the whole ST Fitness lineup. 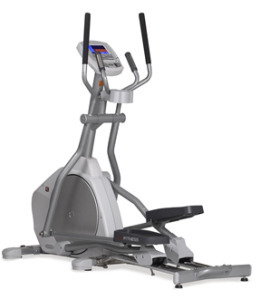 There are a lot of good things going on with the ST Fitness 8820 Total Body Trainer such as chrome rails, a quiet and smooth drive system, a big 19.5" stride length, target heart rate programs, and a low step-in height to the pedals. It runs on a self-contained power supply, but if that is no big deal to you, you can save $500 by buying the 8810 instead. That one comes with an AC power adapter. The few users who have written elliptical reviews have noted problems with the displays on these TBTs which have the self-generating power supply. The display is supposed to stay on for up to four minutes after you stop pedaling, but users complain that the console goes dark immediately. You can avoid this annoying issue by going with one of the ST Fitness models that plug in (i.e., the 8810 and the 4830). Though it is listed at $2,895 MSRP, the 8820 Total Body Trainer sells at Amazon for around $2,440. It shares the same elliptical motion and features as the 8810 ($1,949 at amazon) so it doesn’t make sense to go with this pricier model. While the ST Fitness 8820 Total Body Trainer is a solid machine, it barely makes a blip on the radar when compared to competitor’s models in this price range of $2,000-$2,800. There are so many better values out there that we would recommend you check out a True or Life Fitness elliptical, or perhaps a remanufactured Precor instead.